The Global Hand Sanitizer Market size was valued at $919 million in 2016 to reach $1,755 million by 2023, and is anticipated to grow at a CAGR of 9.9% from 2017 to 2023. Hand sanitizer is an antiseptic solution, which is used as an alternative to soap and water. It is used to prevent the transmission of infection, which is majorly caused through hand transmission, further causing several diseases such as nosocomial food-borne illness and others. 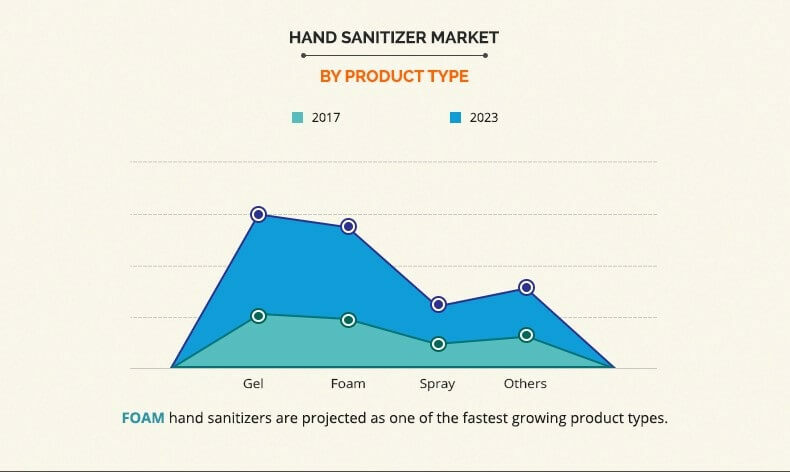 Consumer inclination towards health & wellness and product innovation such as addition of fragrances in formulation of sanitizers are projected to boost the growth of the global hand sanitizer market. Furthermore, improvement in living standards, rise in health expenditure, increase in awareness about hand hygiene, and support from organization such as WHO, FDA, and others towards the need for sanitation augment the demand for hand sanitizers. However, health hazards associated with chemical ingredients are anticipated to hamper the market growth during the forecast period. The report segments the global hand sanitizer market based on product, distribution channel, end use, and geography. On the basis of product, the market is classified into gel, foam, spray, and others. Gel hand sanitizers accounted for the maximum share in 2016. By distribution channel, it is divided into online store, departmental store, pharmacy store, and others. Depending on end use, it is fragmented into restaurants, schools, hospitals, household purpose, and others. Geographically, it is analyzed across North America, Europe, Asia-Pacific, and LAMEA. 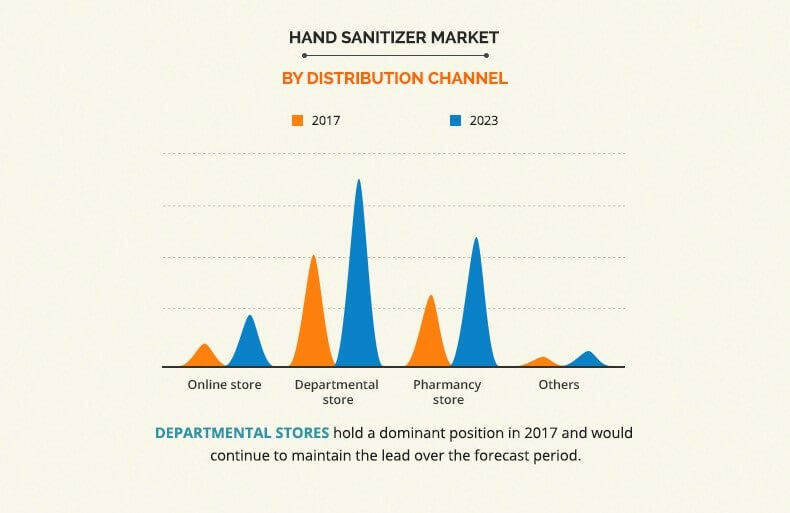 In addition, the report highlights various factors that impact the growth of the global hand sanitizer industry, such as key drivers, restraints, growth opportunities, and the role of different key players. North America dominates the global hand sanitizer market, owing to high hygiene standards among the U.S. population. Moreover, Asia-Pacific is expected to witness the highest growth rate from 2017 to 2023, owing to increase in concern towards health and wellness. Furthermore, improvement in living standards and rise in disposable income are expected to boost the growth of the Asia-Pacific hand sanitizer market. Gel-based hand sanitizers generated the maximum revenue in 2016, as they are easily available in the market and require lesser time to effectively eradicate germs as compared to spray and other sanitizers. However, foam-based hand sanitizers are expected to grow at the highest rate, owing to the fact that foam hand sanitizers immediately cling to hands while applying. In addition, foam pumps are relatively smaller than gel or spray pumps, and hence provide a convenient option to the consumers. Departmental store accounted for the maximum revenue in 2016, as customers prefer to purchase from store such as super markets/hypermarkets. Furthermore, attractive discount policies offered by vendors fuel the growth of departmental stores. However, online store registers the highest growth rate, owing to increase in penetration of mobile phones, rise in e-commerce sales, ease payment options, and attractive discounts as compared to stores. The key players profiled in the report are Reckitt Benckiser Group, The Himalaya Drug Company, Procter and Gamble, Gojo Industry Inc., Henkel Corporation, Unilever, Vi-Jon Laboratories Inc., Chattem Inc., Best Sanitizers Inc., and Kutol Products Company. 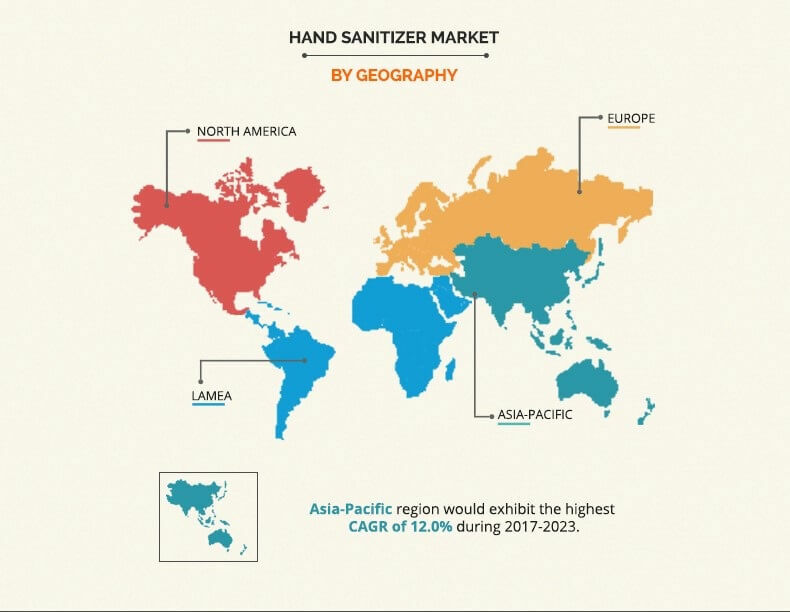 This report provides an extensive analysis of the current and emerging market trends and dynamics of the global hand sanitizer market. This study evaluates competitive landscape of the hand sanitizer industry to understand the market scenario globally.